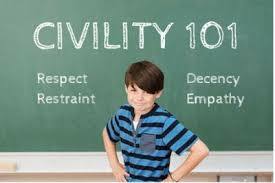 Last week my post The Importance of Being Civil to Others was featured on Voice.ed Radio. A great discussion and thanks to Doug Peterson and Steven Hurley for featuring this post. I think, and they agreed, the discussion needs to go further. In the original post, I mentioned specific situations where we are no longer as civil as we should be, especially in the field of education. I wasn’t writing as much about civility in general society where I agree with Steven, society in Canada is very civil and I appreciate my daily dealings with people. People can be very civil when you do not upset the status quo when you do civility becomes strained. I have to admit I like to push the envelope and write about controversial topics like Catholic Education in Ontario and the inability of school boards to bring about significant change. These are topics that need to be written about. At no time do I ever focus on individuals or write in any way that can be seen as disrespectful. These are topics that seem to bring the knives out. The blocking might not mean that much, but to me, it is a sign of incivility. Usually, I block the Twitter accounts of trolls and those who do not follow the rules set out by Twitter for inappropriate content. I never block people who I disagree with, I usually try to engage in positive conversation and if this is not possible, I simply unfollow them. Blocking someone you don’t agree with is cowardly behaviour and I would say lacks civility. On Facebook, when the conversations threaten to get out of control I simply delete the entire conversation. Sadly, this seems to be the only way to stop people who quickly lose the ability to be polite on-line. The worst offenders tend to be Catholic educators, which I find troubling. I hope this clarifies my position. Again, thank goodness for my very supportive on-line PLN – all are wonderful and always civil!